Oaxaca City (pronounced "wa-HA-ka"), the capital of the state of the same name, is a UNESCO World Heritage site. 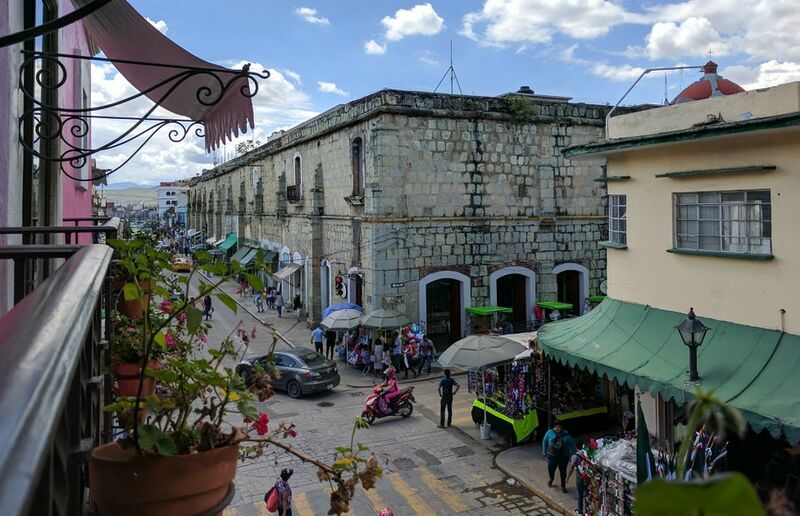 It is a beautiful colonial city with a rich indigenous heritage, that is nestled in a Y-shaped valley in the Sierra Madre mountain range of southern Mexico. Oaxaca is known for its rich cultural traditions, beautiful handicrafts, delicious food and striking architecture. The valley of Oaxaca was inhabited in prehistoric times. Evidence of human occupation in the valley dates back to 12,000 B.C., and it has been inhabited continuously since then. One of the earliest urban centers of Mesoamerica, Monte Alban, was founded in the center of the valley around 500 B.C. The first Europeans to arrive in the area were Dominican friars who came to convert the native people to Catholicism. The colonial town was founded in 1536 as Villa de Antequera. Oaxaca city is located 280 miles south-east of Mexico City in a fertile valley within the Sierra Madre mountain range. The city's elevation is about 5000 feet (1,500 m) above sea level giving it a mild climate year-round. Rainy season lasts from May through September, generally raining in the afternoons, and is a pleasant time to visit. There is evidence of human occupation of the valley of Oaxaca dating back to 12,000 B.C, and some caves in the area contain very early evidence of domestication of corn and squash. The valley has no doubt been occupied continuously since those very ancient times. There are several large archaeological sites located a short distance from Oaxaca city. The most important is Monte Alban, the capital of the Zapotec people from 500 B.C. to 800 A.D. The site is built on a mountain-top, offering impressive views of the valley below. Next in importance is the site of Mitla, which is located in the Eastern arm of the Oaxaca valley and has beautiful geometric fretwork patterns in the walls. Oaxaca boasts magnificent colonial architecture, the most outstanding example being Santo Domingo church and its former convent, which is now home to an impressive museum. Oaxaca is also known for its distinctive cuisine. Dishes such as mole (pronounced mol-ay), a thick sauce prepared with chiles and chocolate are a delight, as are quesillo and tlayudas. See our list of Oaxaca's best restaurants, and the foods you should try in Oaxaca. A beautiful 16th century former convent converted into a hotel, the Quinta Real is centrally located and offers modern conveniences in a colonial setting. A modern and comfortable hotel within walking distance of most of Oaxaca city's sights, there is a pool and breakfast buffet is included in the rate. Located a 10 minute walk away from the Zocalo, this small hotel is clean, comfortable and reasonably priced. A delicious breakfast is served daily on the rooftop terrace. Day of the Dead celebrations in Oaxaca are particularly vibrant. Radish Night takes place every year on December 23rd. The Guelaguetza is a traditional dance festival that takes place during the last two weeks of July.